Somehow, and I’m not proud of the fact, I managed to let the 60s and even the 70s go by without me. While my feminist sisters burned their bras and marched on Washington, I remained at home in my Maidenform. When white men and women marched in Selma and Washington with our black brothers and sisters, I stayed on the sidelines, cheering but non-committed. While our young friends and brothers were drafted to become fodder for our military machine, I didn’t have a draft card to burn. Why worry? Because I was too busy? Too removed? Too safe and secure? Or just too complacent and self-involved? I was just what I appeared to be: a young white woman of a certain class, who took comfort for granted, and assumed that who I was was sufficient to my own goals. Someone else would take care of…everything else. And saying “I’m sorry” doesn’t erase any of it. It’s half a century later, and I’ve been brought up short by reality. Turns out that all those bras, all the blood, all the sacrificed lives and futures didn’t quite get the job done. It only seemed that way for awhile. To me, and to others like me, life settled comfortably around us. But now, here we are, and here I am. But with a difference. Because I’m older. Because I’m wiser. Because I’m ANGRY! Pick your battles and fight – with your feet, with your voice, and especially with your vote! But mostly because I now have more to lose and less time to secure it. The intervening years have blessed me with grandchildren, and saddled me with an aging body …and both require serious tending…in education, social justice and healthcare. And my country is still failing on all three counts. And on the morning of November 9, 2016, I recognized with a jolt the reality of my legacy. And I couldn’t allow that to stand. So, time for Granny to be about her new business: Activism! Turns out all I needed was a good pair of walking shoes, a good sign, and a fire in the belly. 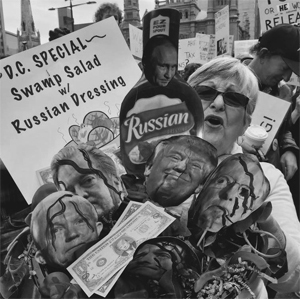 The Womens’ March, Tax March, any March, and a weekly commitment to Tuesdays with Toomey, where I was privileged to meet so many incredibly brave men and women, beset but unbowed, and best of all, other grannies, all with the same fire. So I’m raising hell and hopefully some awareness. Even chased a biker or two down Chestnut Street! If you’ve never done it…very satisfying! My enduring gratitude to all of the men and women who came before me, through all the years and all the fights. And to all of you reading this: the fights go on, and no danger of running out of causes. Healthcare, women rights, veterans, education. Pick your battles and fight… with your feet, with your voice, with your phones, and especially WITH YOUR VOTE!